Nam June Paik (1932-2006) exhibited a progressive music environment for audiences, Random Access (1963) in his first solo show. It allowed audiences to make their own sound collages by interacting with visual audiotapes on a white wall. The interactive approach of Random Access was mainly intertwined with his musique concrète composing experiences. 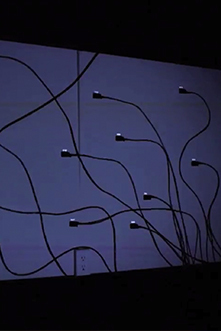 This paper examines the relationship between Paik’s work and musique concrète, and articulates Paik’s contributions to making a prototype of musical interactive art. Based on the study, Diligent Operator (2016) suggests a creative musical space with Max/MSP Jitter and Arduino.